We went on the Jetboat- Dinner and Night Show. Our guide was very informative and friendly. We learned a lot about the history of Moab. The staff was very friendly and helpful. Dinner was great. It was the best meal we had in Moab. Star gazing was amazing on the river after dark. We went on the Jetboat- Dinner and Night Show. Dee, our guide, was energetic and really seems to love his job. The dinner and boat trip were both VERY organized experiences. The food was excellent. We really enjoyed ourselves. Every member of the Moab Adventure Center staff was kind, courteous, and genuinely interested in making our experience positive. What a great group of people! What a magical evening with a full moon and great temperature on the Dinner & Night Show Tour! Thoroughly enjoyed the light show and music. The Stars at Night, are Big and Bright, Deep in the Heart of Moab! What an incredible evening! The Dinner and Night show tour was the perfect choice for our party of eight. From the beginning of the evening to the end, this package deal is finely tuned. We were greeted immediately upon arrival by happy, upbeat staff. After dinner came the river ride with our guide who was so pleasant, knowledgeable, and funny. The next part of the tour was nothing less than spectacular….and perfectly timed. Narration and music echo through the canyon in perfect harmony, then lighting of the canyon walls and times of silence for reflection. Lastly, the "piece de resistance", God's lighting of the sky. Awesome! Thank you! Rory was so much fun! We loved every minute on the river. 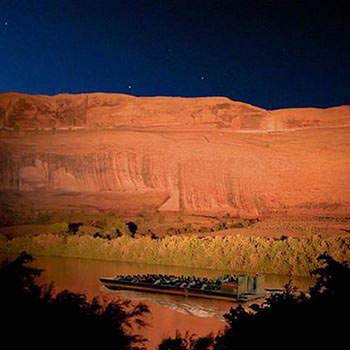 The jetboat tour in Moab, Utah was ideal for our family of five…boys ages 11 and 8 and our daughter age 4. We were worried about finding something that would make all of them happy. The jetboat made us ALL smile! I was worried for the price the food wouldn’t be as good as I was hoping. I was wrong! It was the best meal we had in Moab! My kids were thrilled, my husband was happy and I was happy (thanks for having diet coke– six hours on the road and I really needed it!). The employees were amazing and friendly and my kids ate up the swan apples. Totally worth the price! We will be back! All of the people involved in providing the service were fantastic – from our driver, meeting the servers, the fantastic food and the wonderful cruise down the river with the light show was wonderful. People seemed to like working for your company – they were all so accommodating and nice and friendly. Thank you.